It’s busy here for the holidays, and things always seem to take more time than you think they will. We’ll be taking some time off before getting back to work in January to prepare the Erg Machine for another trip to the Sahara! If all goes well, we’re planning to go back in April, but we have a little maintenance to perform in addition to finishing the new microcontroller for the transmission. We got some good news from the Tatra Factory just in time for Christmas: they’ve completed maintenance on the EM-2, and everything has been put back together! We’ll be going to the Czech Republic in a few weeks to pick it up once they’ve finished repainting it. We’re also putting together a series of posts describing the trip to Tunisia last September. In the meantime, here’s a picture of the EM-1 and the EM-2 side-by-side in our workshop hangar not long before we took the EM-2 to Kopřivnice. 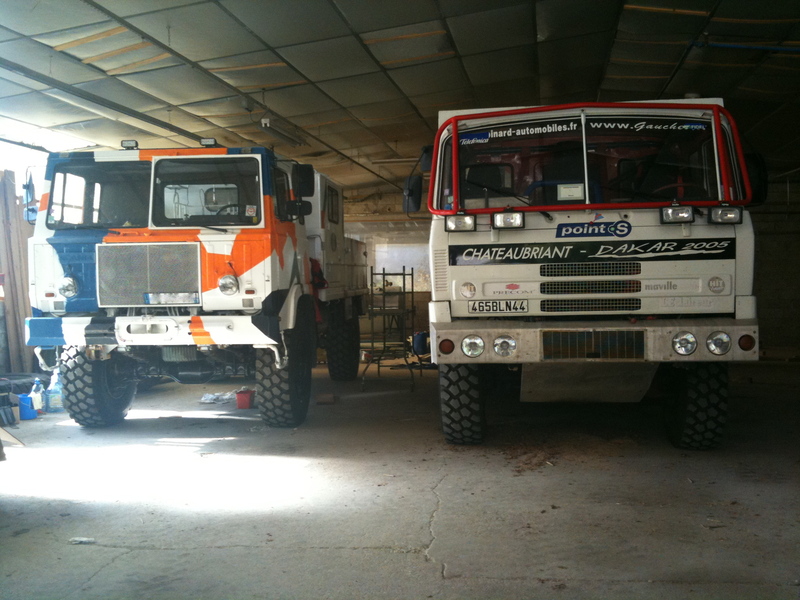 The perspective is a little misleading, the dimensions of both trucks are almost identical.